The book How the Revolution Triumphed was published in 1930, thirteen years after the October revolution took place. Its primary didactic goal is to reintroduce the chain reaction of historical events that led to the Bolshevik seizure of power and, even more importantly, to ensure the correct interpretation of the anti-governmental coup among the young generation of new Soviet readership. 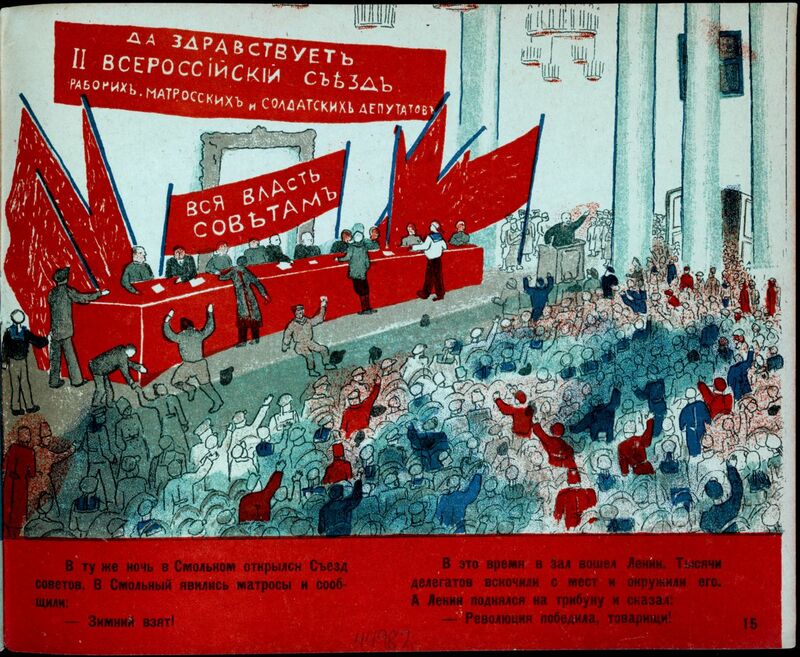 The book’s target audience was the children born immediately after the 1917 revolution (in the age bracket of 7-11 years old by the time of the publication of this illustrated edition). The book relies both on the clear visual expressionism of Alisa Poret’s imagery and the accompanying text (the primacy of pictures over text is implied by the fact that the author’s name is omitted, who, it can be presumed, was someone in the editorial staff of the State Publishing Company – Gosudarstvennoe Izdatel’stvo).Alisa Ivanovna Poret (1902-1984) started her career as a children’s book illustrator in 1925 (and had worked for Detgiz since 1928, where, among other projects, she had contributed to the popular children’s magazines Yozh and Chizh); concurrently she took an active part in the contemporary artistic avant-garde scene. A former pupil of K. Petrov-Vodkin at VKhUTEIN, in 1927, she became affiliated with Pavel Filonov’s group – Masters of Analytical Art. At the time of the book illustrations under review, Poret was a close acquaintance of the Russian absurdist poet Daniil Kharms, who later became romantically infatuated with the graphic artist until they terminated their relationship in 1932. Traces of the avant-garde technique are recognizable in Poret’s illustrations in How the Revolution Triumphed and, especially, in the schematic reduction of the events into a series of graphic vignettes, offering choreographically orchestrated relationships within the busy scenes rather than illustrating the given text verbatim. While Soviet art was expected to promote “proletarian art” and “new realism,” Filonov’s students sought to depict the inner essence of a man’s social existence, which often led to their illustration of the Soviet reality with a surrealistic touch (or even an element of “alienation,” as some hostile critics would characterize it). While Soviet art was expected to promote “proletarian art” and “new realism,” Filonov’s students sought to depict the inner essence of a man’s social existence, which often led to their illustration of the Soviet reality with a surrealistic touch (or even an element of “alienation,” as some hostile critics would characterize it).